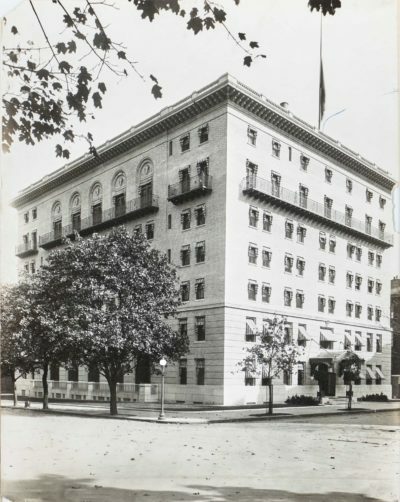 This photograph may be the first documentation of The Army and Navy Club clubhouse in 1912, upon completion of the building that remains the Club’s home in the 21st century. The building originally had seven floors. It closed in 1984 for an extensive reconstruction, adding five floors, relocating the dining room from the sixth floor to the ground floor, adding the racquetball and squash courts to the B-2 floor, and renovating the interior to the way it generally appears today. The architect-added floors remained true to the building’s original design, preserving much of the original cornice above the seventh floor windows. The Club occupies floors 1-4 and two sublevels, while floors 5-12 provide office space for several professional entities, including the New York Times Washington, DC office.